No one was seriously hurt this afternoon when a portion of a dock in Caye Caulker village broke, throwing some people into the Caribbean Sea. The dock belonging to one of the water taxi operators, appears to have buckled under the weight of the many people who were standing up waiting to board their boat for a trip back to Belize City around 4:45 pm. It was rebuilt overnight and the water taxi's seemed to be moving on schedule with a little more diligence to how many can be on the bridge at a time. I think they did good given how quick they responded to the situation. Wish they would stop overloading the boats as well. 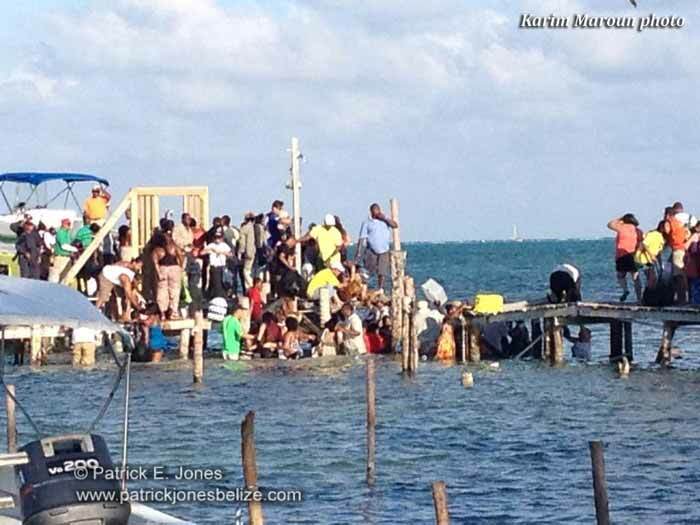 Thousands of Belizeans rushed to the cayes over the Easter weekend and most of them went on water taxi's. 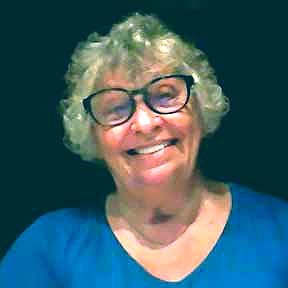 But, coming back nearly proved disastrous in Caye Caulker on Sunday evening at around 5:00, when hundreds of passengers queued up on the San Pedro Belize Express Pier to get on the boat back to the city. But the rickety wooden pier couldn't take the load and at about the half-way point, an entire of it collapsed - causing the waiting passengers to fall into the sea. Fortunately it was only a short distance down, and the water was shallow. No one was seriously hurt, passenger report receiving a few scratches and losing cellular phones. San Pedro Belize express sent out a release today saying that their staffers, Port Authority and Coast Guard were present and asked passengers wait on the beach to ease the stress on the bridge. But the release says, quote, "this request was met with rebuttals as the crowds continued to move onto the bridge against the directives of the authorities resulting in a portion of the bridge buckling under the pressure." The release adds that the company is quote, "making every effort to fortify its ports and implement additional safety features to ensure this incident is not repeated." The Commissioner of Ports Merlene Bailey Martinez says it is reviewing the accident, but has no sanctions planned at this time. And while that is the treatment of the pier failure, there's no way to account for what happened after. As you can imagine, folks desperate to get off the island rushed over to the Caye Caulker Water Taxi pier. Not wanting to create another collapse police tried to enforce crowd control and that's when all kinds of pushing, shoving and fighting started to happen. There were fights between civilians and a fight involving police. That happened when police tried to restrain this man, Gregory Myers, who was identified to us as a former US Soldier. Island police got information that he was causing trouble on the pier - Gregory says he was trying to maintain order. Still, police tried to arrest him, which led to a struggle on the ground, where the officers ended up choking him as a means of restraint. Myers was charged with three counts of assaulting a police officer and resisting arrest. The San Pedro Belize Express Water Taxi today issued a statement regarding the partial collapse of its dock in Caye Caulker village over the Easter holiday weekend. As we reported previously a portion of the dock collapsed on Sunday evening, throwing several people into the Caribbean Sea. The official statement goes on to say that a fleet of 15 vessels and two rented catamarans were pressed into service over the Easter holidays to move passengers between the islands and the mainland. A melee involving civilians and police officers erupted in Caye Caulker this past Saturday in the wake of an incident in which a group of passengers who were returning home from the island took an unexpected dip in the Caribbean Sea after a crowded pier on which they were standing collapsed and the vacationers and their luggage found themselves in water, over which, just a few seconds before, they had stood. 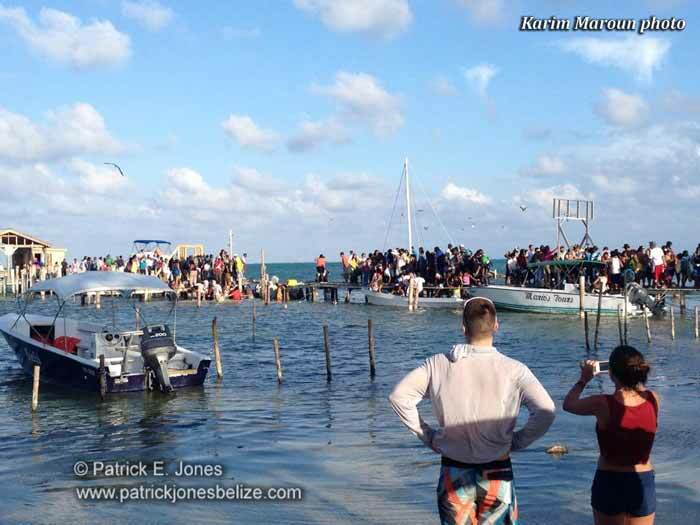 Scores of travelers – which included tourists and Belizeans visiting from the Diaspora – were waiting to board the last scheduled San Pedro Belize Express water taxi around 5:00 p.m. when disaster struck. After the incident had occurred, we understand that an alternate pier – belonging to the Caye Caulker Water Taxi Association – was then utilized to move the civilians off the island, but that only made matters worse, as we were told that there were all kinds of jostling and fighting among the massive crowd of anxious passengers. Police were soon called to diffuse the situation and enforce crowd control, but they soon became involved in the brawl after they were reportedly met with resistance and had to resort to the use of force as a result. A video which was posted on social media shows at least three police officers, one in civilian clothing, physically restraining an individual by putting him in a chokehold. Unconfirmed reports are that the man, reportedly identified as Gregory Myers, was behaving in an unruly manner and may have aggressed the officers first, but we were told that Myers was merely trying to maintain order among the chaos when police tried to arrest him, which led to a struggle on the ground between Myers and the officers. According to our reports, he was later charged with three counts of assaulting a police officer and resisting arrest. Reminds me of the time, back before the bridge, when one lunch time so many bikers and their bikes crammed onto the pull ferry that it was grounded and could not budge. Not a single person would get off to lighten the load and none would help the guys pulling the ropes and using poles to push. The bikes had all rushed ahead of the golf carts so there was a long line of us waiting. What could we do but shake our heads?